Current UK Tyre Law states that Tyres should be free from certain cuts and other defects. Cars, light vans and light trailers MUST have a tread depth of at least 1.6 mm across the central three-quarters of the breadth of the tread and around the entire circumference. 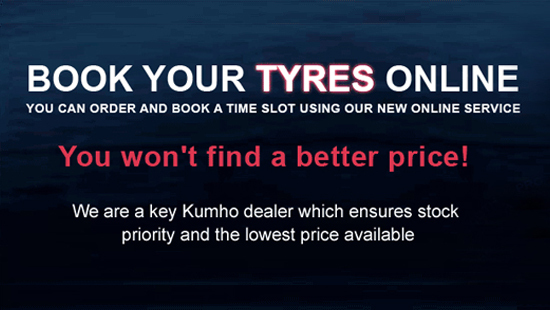 We are a key dealer for Kumho tyres, giving us priority service, quick delivery over other dealers and crucially we can take advantage of the lowest prices! We stock a vast range of tyres of all the leading manufacturers allowing us to provide a quick convenient service to our customers whilst they relax in our comfortable waiting area. Contact us to book this exclusive service. At Cowley Road Tyres and Exhaust Centre we stock and extensive range of exhausts to fit the widest range of vehicles. Most parts are available within the hour if we do not have them in stock. Your vehicle’s exhaust system helps to direct poisonous gases away from the vehicle interior, preventing the driver from being exposed to noxious gases. Another function is to ensure the vehicle is a fuel efficient as possible.